This cute little book is a Children’s Fiction book. It is written completely in diary format coming from Davina Dupree. 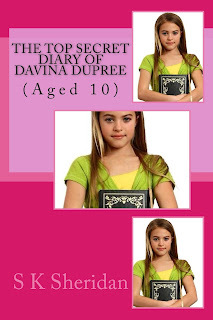 Her parents sent her to boarding school, and she decided to keep a journal with her to write down her experiences. During the first part of her year there, Davina and her roommate discover there is just something not quite right with their art teachers. Being typical young girls, they decide to be little detectives. This was what I liked the most about this book. Kid’s always have fun trying to be detectives, so reading this book will be fun for them to read and relate to. They help to uncover the truth about their mysterious teachers and help save people’s lives and famous artwork all at the same time. This is a cute story for children. I even enjoyed it, and it is a book I would have thoroughly enjoyed reading it as a kid. It was written well for children to read and enjoy. They will be able to relate to the characters and their imagination can run wild with all of the plot twists. 5/5 stars. This book would make a great gift for young readers.